Although not a massive fan of meddling with the laws of the game, sometimes someone comes up with a proposed change in the laws that makes eminent sense. 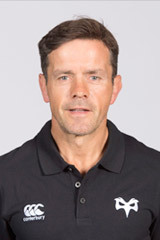 On this occasion it is Ospreys head coach, Allen Clarke, who has put forward a clever idea to help create space amidst rugby's increasingly congested defensive lines. Clarke suggests that if a player kicks the ball from inside his own half and the ball bounces into touch in the opposition's 22, the kicking side should be awarded the throw-in at the subsequent line out. To defend against this and prevent conceding a dangerous set-piece in its own 22, the defending team would therefore need to position its wingers deeper, thus reducing the numbers in the front-line defence, ergo creating more space for the attacking team. Of course, a defence may still choose to push up to deny space, in which case the defending team may be vulnerable to the kick in behind and then having to defend a line out deep in its own territory. The beauty of the proposal is its simplicity. And who knows, it might even work!